"Engaging puzzles, an engrossing story, and beautiful art make this a hugely enjoyable commercial game, well deserving of 5 cups." 7 years on, it's still a great game. This kind of game never ages. I bet I'll play it again in a few years time. Some puzzles were really hard even with the walkthrough but it was worth persevering. A deeply engaging game - one of my favourites. I'm usually into more light-hearted stories -- but I couldn't miss out on our own indie AAA title, now could I? ;) And it was more than I could've expected. It was exciting, thrilling, smart -- and beautifully executed. The graphics were gorgeous and the cast were spectacular (I liked Logan's performance even more than in Primordia -- which says a lot). They made the characters even more relatable (the front desk lady at Antvorta being my favorite of the bunch, her online romance was great comic relief).The puzzles were clever, logical and fairly intuitive. I did have a hard time jumping between different menus (and some other minor issues) -- but the GUI was great in how much freedom it allowed. I also kept thinking how much the whole story reminds me of Broken Saints, a flash graphic novel: four strangers connected by fate, a grand conspiracy involving new, groundbreaking technology with great potential for abuse... A tech nerd and girl haunted by nightmares (those sequences were my favorite, very surreal and dark)... Not nearly as trippy (except for the nightmare scenes, maybe), but still -- quite a ride! revolutionary, I hope more developers realise the potential of this game's memory system and use it. It is the best innovation in genre since a long time. It's not overstating it to say that this is one of the best adventure games I've ever played. Great classic feel while still being innovative, and not at all derivative. Amazing story with great, unique characters. One of strongest game experiences I had for a quite some time. Just FYI, this game is not 'mild' language but 'strong' language. Couple of F-bombs and other colorful words. A worthy multi-award winner. I loved the fact that you could use anything in your location or inventory as a conversation topic, an innovative and highly effective feature. This may very well be my favourite AGS game. My first memory of acquaintance with this game is a feeling of astonishment by the amount and quality of coding put into every detail. Being used to "default" "old school" adventure user interfaces, I just did not expect such an elegant GUI design. Second thing are animations and backgrounds. 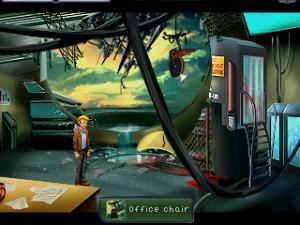 Although Resonance features low resolution graphics, the developers were able to produce realistic and seamlessly looking images of world and characters, where every move and action may be distinguished without problem. You may find enjoyment in simply watching how people are walking around the room :). The story is very interesting and intriguing. Four characters, every one of which have his or her own purpose, opinion, memories and even dreams. You keep wondering, are you playing the "good" or secretly "bad" character.